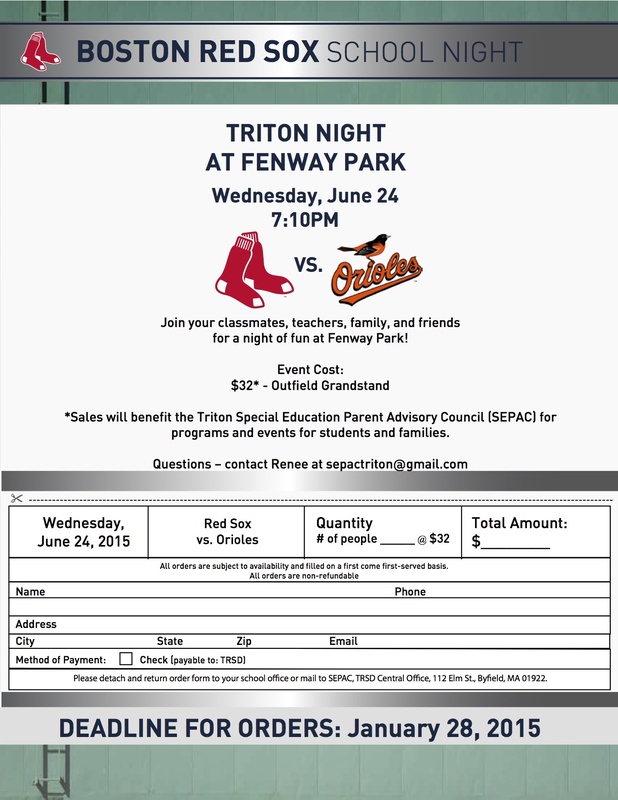 Tickets are now on sale for Triton Night at Fenway Park on Wednesday, June 24, for the 7:10 pm game featuring the Boston Red Sox vs. the Baltimore Orioles. Reserved group seating will be available for $32/seat in the outfield grandstand. Join friends, neighbors, teachers, staff, and community members to celebrate the start of summer. The event is open to the public; one does not have to be a member of the school community to purchase tickets. For each ticket sold, the Triton Special Education Parent Advisory Council (SEPAC) will receive $5 to use for programming and activities for students and families in the school district. SEPAC, TRSD Central Office, 112 Elm St., Byfield, MA 01922 with your name, address, email, phone number, and number of tickets wanted. The tickets are available based on availability on a first-come, first-served basis through January 28. Tickets are non-refundable.